Cromford Leather are proud to have been approached by the Kingsman 2 production company to tailor some bespoke shearling garments for this fantastic film. 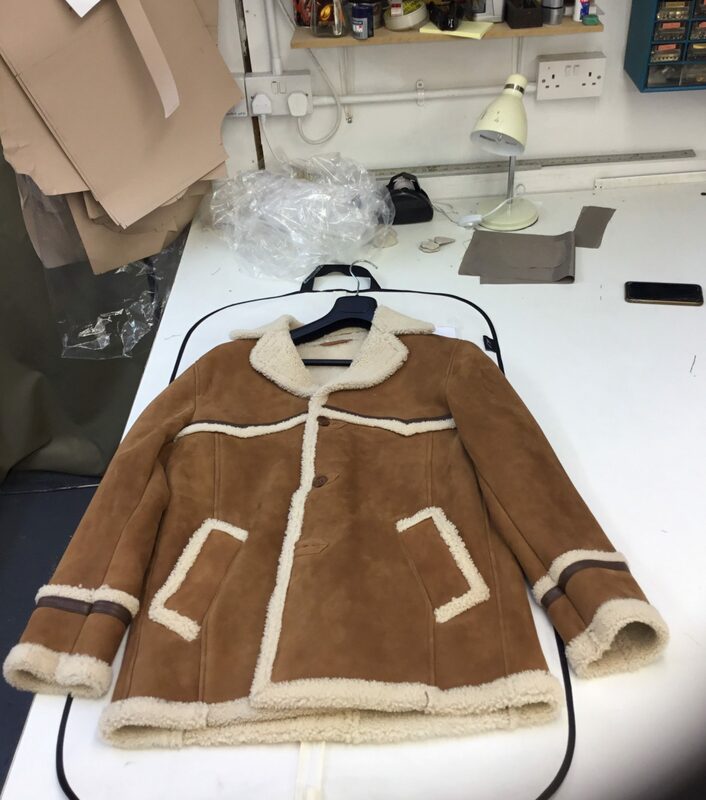 The sheepskin jackets Cromford Leather produced during this process, included a beige bomber jacket which Channing Tatum “Tequila” was fitted for and a shearling coat worn by Colin Firth “Harry Hart”. The very nature of what we do at our London atelier lends itself perfectly to this very bespoke nature of tailoring. We work with the client to bring their ideas to life. The process begins with the production company sharing drawings and sample garments with us so the vision is understood at the outset. We work with the client to drill down to the detail of the design and composition of each garment. 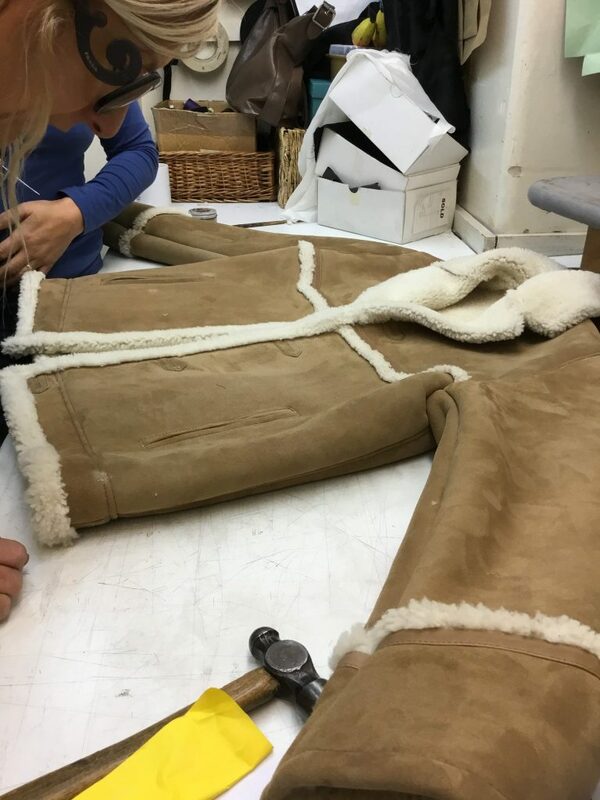 All our skins (leather, suede and shearling) are of the highest quality, so our clients are able to simply select the colour and finish for each garment, confident that only the finest materials will be used. At the atelier, we then create a sample garment and it’s once this first piece comes to life that the real chopping and changing takes place! Anything from fitting measurements to the stitching around a single buttonhole can be changed at this stage. Communication and efficient production is key during this stage to ensure that deadlines are reached. For example, the original design for Channing Tatum’s beige bomber jacket had classic shearling fur edges, but by the end of the process, they had been removed completely! The design and production of bespoke pieces is at the heart of Cromford Leather’s business model. We take huge pride in everything we do and take great pleasure in working with individuals, or indeed whole costume departments, to achieve the end goal of stunning high quality garments, perfectly tailored for the individual they were made for. Producing a line for Mr Porter’s Kingsman range entails acquiring additional stock of the same shearling used for the garments used in the Kingsman 2 and then grading the pattern (the process of developing a range of sizes for the same garment). We then made sample jackets which went through the rigorous quality checking process at Mr Porter, and once passed, we started production. “Production” may sound like a high volume process in a factory, but at Cromford Leather, production will always mean “producing handmade garments in the heart of London”. For more information, or if you are thinking of treating yourself to a bespoke garment this Christmas, we’d love to hear from you. Please contact us.